Black Panda shrimp were first bred in Taiwan. They are probably one of the most popular dwarf shrimp variants right now, and they are frequently carried under the name Taiwan Bee or Shadow Bee. They are said to have first appeared in a strain of red and black Bee shrimp, however, this is just hearsay. The Black Panda dwarf shrimp fascinates the enthusiast by its deep, intense, unbroken black colour and two very densely pigmented broad white bands, sometimes with a slight hue of blue. water temperatures of 20 - 26 °C, a slightly acidic pH and a low carbonate hardness. The Taiwan Bee - Black Panda dwarf shrimp grows to a maximal body length of 2 cm and reaches an age of approximately two years. The males stay slightly smaller than the females and do not get as plump. 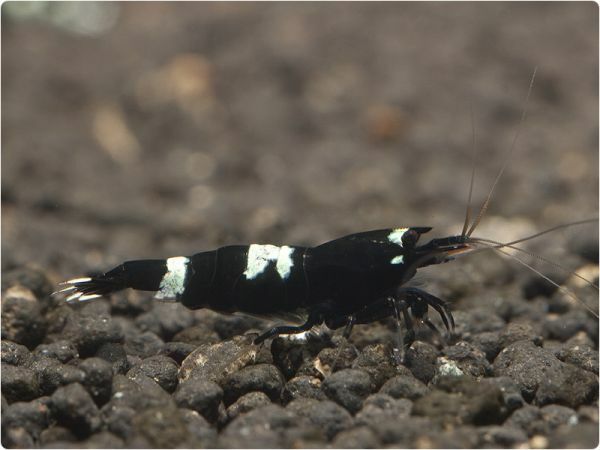 The Black Panda shrimp is an omnivore and will eat just about any food. The species is very peaceful. You can easily keep them together with fish that do not predate on shrimp. When these shrimp are happy with their environment, the females will release up to 25 almost fully developed shrimplets after carrying the eggs under their pleon for around 4 weeks. Taiwan Bees do not have any special requirements regarding the aquarium decoration ... here you can use your imagination freely. The shrimp are happy with a little moss and driftwood ... and if there are some hiding-places like tubes or brown autumn leaves (oak or beech) in the tank, the Taiwan Bees will have everything they need. Taiwan Bee Shrimp feel the happiest when the pH is between 5.5 and 6.5, a total hardness of 5 - 6° dGH (German hardness) and a carbonate hardness of 0 - 1° dKH (German hardness). The temperature should be between 21 and 23° C ... varied food (predominantly of vegetable origin, and frozen food fed sparingly) contributes to heathly, vital, happy shrimp. der Transport erfolgte über Nacht, ein Tier tot (passierte vermutlich beim Fang).Tiere entsprachen optisch nicht dem Cover u.somit meiner Vorstellung, ansonste jedoch ok.
Sehr schöne, muntere Tiere, die sich auch schnell an das neue Becken gewöhnt haben. Schöne muntere Tiere mit schöner Färbung. Auch eine Woche später schwimmen sie aktiv im Becken herum. Die Black Pandas sind jetzt mittlerweile 3 Wochen bei mir im Aquarium. Nach kurzer Eingewöhnungsphase haben sie das ganze Becken erkundet. Sind sehr lebendig und putzmunter. Top Qualität. Auch die Farbpracht der Tiere ist beeindruckend. Sehr lebendige Tiere in einer top Qualität. Die kleinen haben sich sehr schnell bei mir eingewöhnt und gingen direkt nach dem Umsetzen in ihre neue Heimat auf Entdeckungsreise und Futtersuche. Sie machen einen stabilen und gesunden eindruck, sehr gute Farbdeckung.